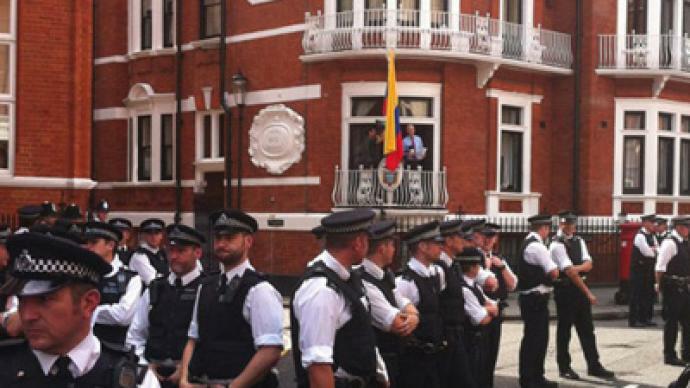 Ecuador is still concerned over the UK’s threat to storm its embassy in London. 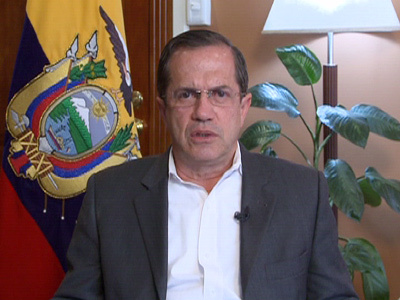 In an exclusive interview to RT, the country’s Foreign Minister Ricardo Patino said that Ecuador will not tolerate what it sees as a clear breach of international law. 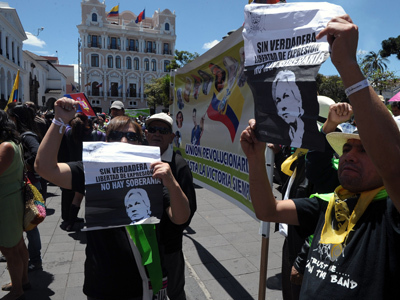 ­RT: What does Ecuador think about the huge support it has received from ALBA and UNASUR countries, apart from the support of many social movements and activists who spoke in favor of giving Julian Assange political asylum? Ricardo Patino: We are grateful for the immediate support we received from the foreign ministers of Latin America, Caribbean states and ALBA member states. 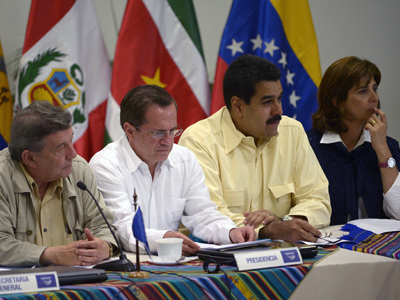 We got convincing and prompt support from ALBA and UNASUR countries. We hope to get the same kind of support on Friday at the meeting of the Organization of American States members. We had the support of the Forum of Sao Paulo that includes left-wing parties from across Latin America and the Caribbean and other political bodies such as COPAL and the Socialist International organization. 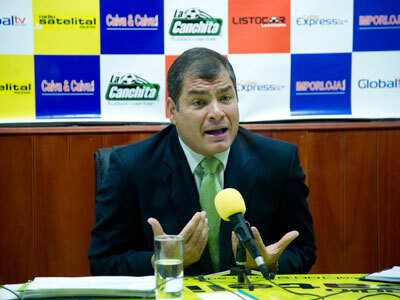 So almost all the left-wing or centrist or leftist-centrist parties took the side of the Ecuadorian government. It is also worth saying that such people as Michael Moore, Oliver Stone and Nobel Peace laureate Adolfo Pérez Esquivel backed our decision to grant political asylum. 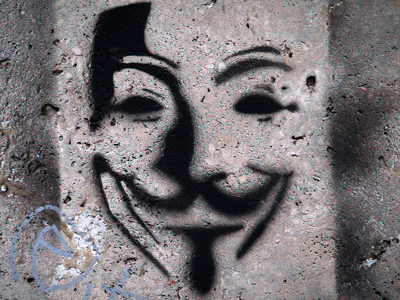 They stood up against the blatant threat of the UK to raid the Ecuadorian embassy and arrest Julian Assange. We are grateful for this support. RT: What can you say about the UK’s threat to break into your London embassy? Will you continue negotiations with the British government? Can the embassy be considered a safe haven or is it still under threat? RP: We are still very concerned about it, as the threat remains in force. The UK has not denied it so far. On the contrary, they’ve announced that they still have an obligation to extradite Mr. Assange to Sweden no matter what – without taking into account the decision of the Ecuadorian government. They openly show their disrespect for Ecuador’s position, and we are worried they will go ahead with their threat, but hope it would not happen. I believe that the stance of all other Latin American countries along with Ecuador is crystal clear. We will not accept any violation of our embassy rules as it would be a breach of international law, of international treaties which clearly call for respect for the diplomatic immunity of embassies all over the world. That commitment is set forth by the UN Charter and Vienna Convention in particular. RT: Are you going to bring the issue up at the Security Council or the International Court of Justice in The Hague? Or do you think you will be able to find a solution during the negotiations with the UK? RP: We hope so. First, we really want the UK to present their apologies for this threat in written form or, at least, admit that it was a mistake. And only then will we be ready to negotiate on the issue. We hope it will be enough to find a solution. We believe the UK understands how important it is to give one a chance for rescue, so that a person wouldn’t have to stay in an embassy for decades. We also believe they will accept Ecuador’s sovereign decision. In case they don’t, we will nevertheless be able to find a way out. Apparently, then we’ll have to turn to the International Court of Justice to be able to ensure safe passage for Mr. Assange. RT: Do you think the strong support of Latin America for Ecuador is enough to prevent a possible attack on its sovereignty by the UK? Or maybe there’s a need for an international organization to intervene? RP: It is difficult to answer this question, because when Ecuador decided to consider an asylum request by Mr. Assange, it made sure that it had the support of the ALBA and UNASUR countries. And now it also has the support of the Organization of American States. We hope that international organizations in our regions of the world will also take a stand. We are working on it. We hope that the UK realizes that it has made a grave mistake and that the best way to right this wrong is to not only give up its threats, but also to help resolve this situation. RT: Is it possible that the UK and Latin America will sever ties? How would it affect Ecuador’s economy? RP: I don’t know. I can’t predict the future. Of course, if the British authorities decide to invade our embassy, the consequences will be very serious. It will prompt a response from all Latin American countries, not just Ecuador. But I don’t think anything like that will happen at this point. Our trade and investment volume with the UK is not very significant, but we value our bilateral relations nonetheless. We think that these relations are very important, as important as our ties with all other countries. The current government has worked hard to expand cooperation with them. Our foreign policy was not balanced before – I called it a “distorted map of the world”. Ecuador used to focus on the US and Europe. We still see these relations as important, but they should not be our only partners. Now Ecuador has stronger ties with Asia, Africa, the Middle East, and the whole of Latin America. This also gives us more freedom to make independent decisions, because fortunately we don’t depend on other countries. It doesn’t mean that we don’t value our relations with the UK. But the world is much bigger. RT: What will your next step be? Do you have a plan on how to take Julian Assange to Ecuador? Will you still need to negotiate it with the UK? RP: Of course, the only way to move Assange to Ecuador is to get permission for safe passage from the UK. This is our main goal. I hope we will be able to get it by negotiating with the British authorities, discussing the issue in a friendly atmosphere. RT: Do you think Washington is trying to punish Ecuador for granting asylum to Julian Assange? RP: Washington is not our parent or our teacher to punish us. The US is a big and powerful country. It’s a country that has great influence all over the world. However, when it comes to international relations, every country has sovereignty and its own influence. That’s why we don’t think that any sort of punishment is possible. We also think there’s no reason for revenge – let’s call it “revenge”, it’s a stronger word than “punishment” – revenge for Ecuador having made an independent decision. The US takes similar independent decisions every day, I mean decisions to grant asylum, officially or unofficially, to thousands of people, just like the UK and other countries do. The only difference is that it appears to some that a small developing country has fewer rights to protect the freedom and the lives of other people than big countries. We think we have the same rights. And there is no way we will tolerate any kind of revenge. RT: How would you describe the current relations between Ecuador and the US? RP: Our relations are steadily developing, and we seek to improve them after the US ambassador was ejected from Ecuador last year. We have a new ambassador now; he arrived just a few weeks ago. We think our relations with the United States can improve, and that is our goal. We are working to schedule a meeting where we could discuss our bilateral ties. We hope they will improve. There certainly was a setback, when neither the US nor Ecuador had ambassadors in their respective capitals. We believe that the situation with Julian Assange will not lead to any kind of disruption in our relations, because it was the United States that said it was a problem between Britain and Ecuador. There are really no grounds for our relations to sour. RT: By giving asylum to Julian Assange, what kind of message is the government of Ecuador trying to send? Does that mean that Ecuador will now play a leading role in the debate over the mission of the media and freedom of speech in today’s world? RP: One of the key principles we relied on when granting asylum to Julian Assange is of course the freedom of speech. Julian Assange is a global icon of freedom of speech, but there are some countries looking to stall his activities, restrict his freedom and even gag him. We want to make it clear that our decision was aimed at defending freedom of speech and the right to life, the right against arbitrary arrest, the right to asylum from persecution – the humanitarian law applied by all countries. It’s not our whim, the right to asylum is set forth by the Universal Declaration of Human Rights – anyone who is persecuted has the right to seek asylum in another country, and it is up to that country to either give it to him or not. Ecuador is an active advocate of these principles, which are part of international law. We didn’t make that decision for any political gains or to score points ahead of the elections, as some journalists assumed. We made it because there are principles out there that need to be protected. Ecuador will continue to protect them, despite international media campaigns. Today, Ecuadorian media, large national media corporations in particular, no longer enjoy the power they illegally used to exert for quite a long time. They are losing it. Previously, even a minor media campaign was enough to sway public opinion, to dismiss and appoint ministers and make people elect the kind of presidents they needed. 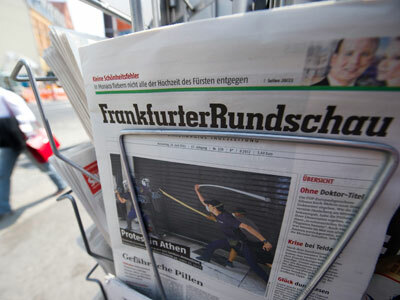 Many national media have the support of transnational corporations that they call the defenders of freedom of speech. We think they only defend the freedom of companies and not the freedom of speech. Freedom of speech stands above them, it’s about making the media being genuinely democratic, ensuring that everyone enjoys freedom of speech. This is the agenda of the Ecuadorian government at the moment. RT: Is there anything you would like to add? RP: We want to make sure that the threats by the UK are exposed and become known to the public. The UK needs to realize that it’s made a mistake and it should fix it. The best way would be to admit that this has been a grave mistake and resolve the tense situation that emerged between the UK and Ecuador, and also other countries of Latin America. The UK can resolve it by giving Mr Assange safe passage so that he can continue to practice his right to the freedom of speech, the right that the UK says it respects so much. RT: Thank you for the interview.